so after beeing ill for to long, I started working out some of these projects. 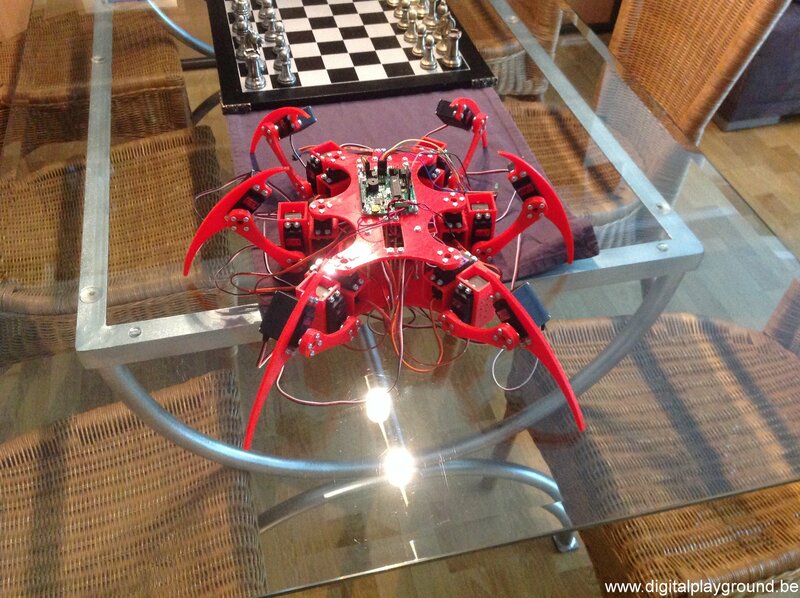 So, Andy, my hexapod, is finally “up and running”. I used a BotBorduino & SSC32 to control the servo’s, a wireless PS2 controller to control “the beast”, and a 7.4V LiPo. (I used 4 diodes in serie, to get the voltage down to about 5V Furthermore, I used the LynxMotion Phoenix firmware. Click here to see a short movie of Andy – the hexapod. I discovered these small walking minions on thingiverse. 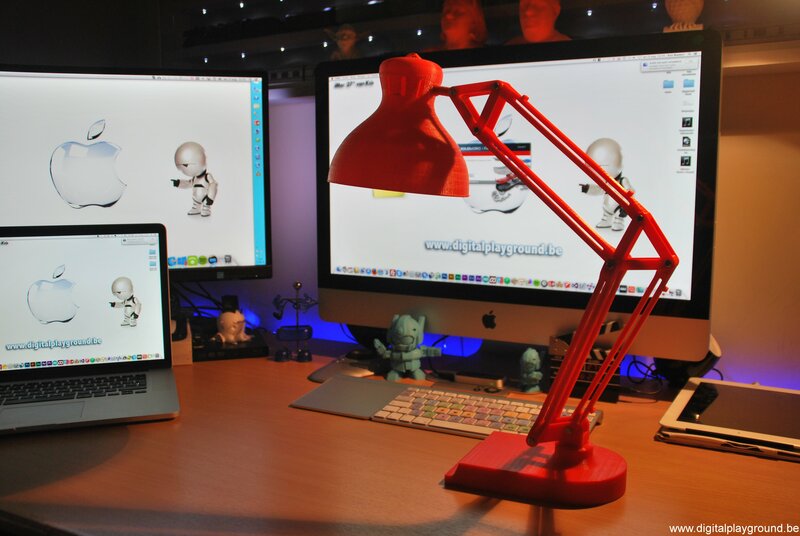 We found some Desk lamp files in solidworks format on GrabCad. I modified it, so I could fit an Arduino mini, an RF24L01 and some FETs into the feet of te lamp, and a luxeon 3W in the head. Stumbling on a Spanish page, maintained by Julio Jose, I discovered his selfbalancing robot, called “B-Robot”. so I could run it on the (Arduino) hardware I still had littering around. 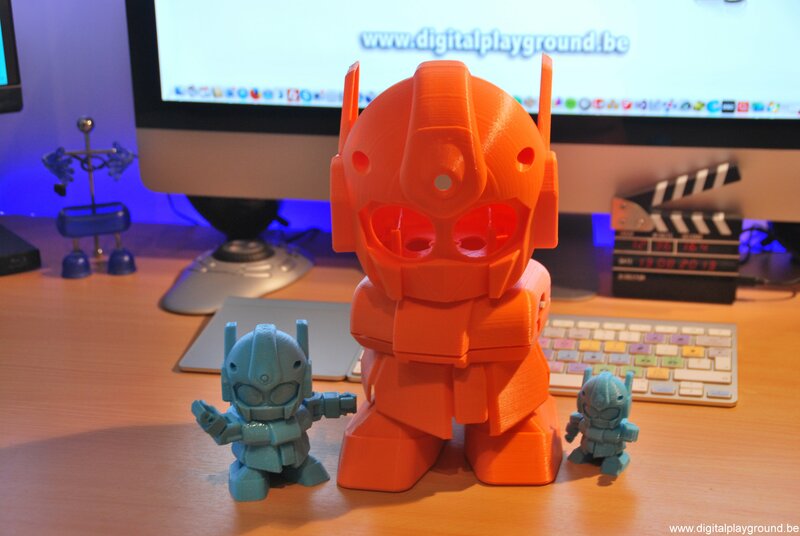 What started as as kickstarter project , did go very well for the Rapiro guys ! They needed 20.000 pound, but managed to fund about 75.000 pound. So, they kept there promis, and also released the “source-files” of the Rapiro. 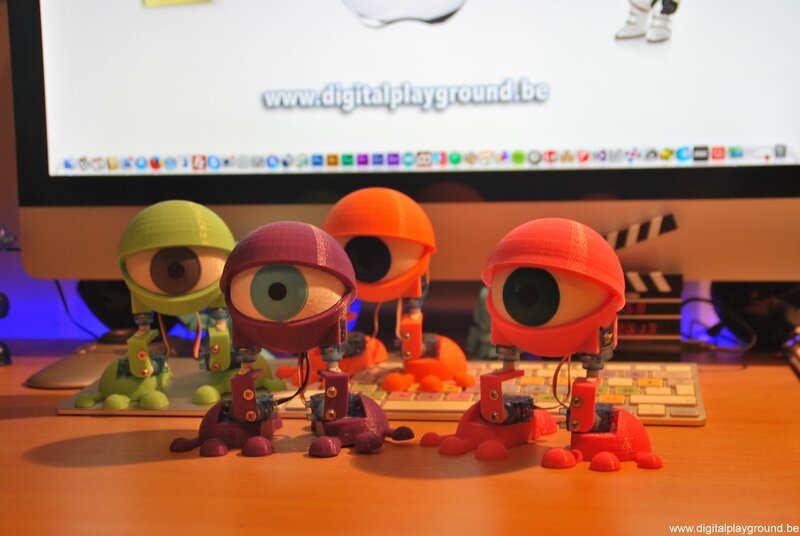 They also released assembly instructions, arduino firmware and schematics on the Rapiro website. 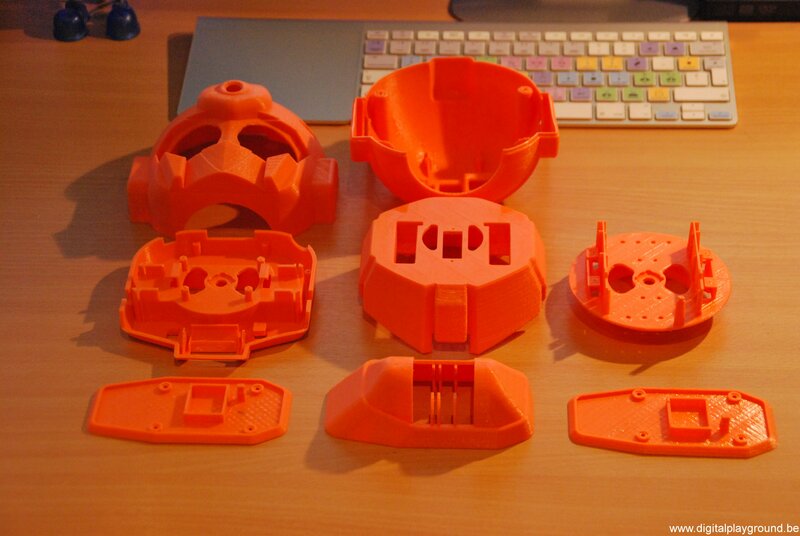 I still need to complete the assembly and start programming this little robot. 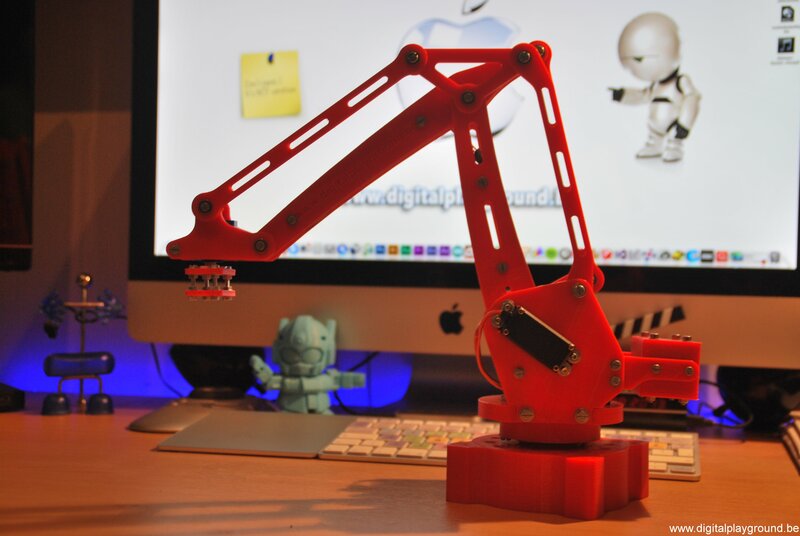 uFactory released the uArm design files in STEP/IGES format on GrabCad. I downloaded them and converted them to Solidworks. After thinking what to do with such a “Robot Arm”, I came up with the idea to build a clock with it. The time is represented in HH:MM format, by 4 balls. I designed the balls with 2 numbers on each ball. and one ball for the hours needs to be replaced to indicate the “new time”. needs to be replaced. Furthermore, every 2 minutes a ball is replaced. but the transition between 23 and 00 is a bit different. the right ball with the three is replaced with the ball with a zero on it. The left ball does have the two and zero on the same ball, so only rotation of this ball is needed for the transition between 23 and 00. So, to be able to show the new time as fast as possible, I will use a different arm for the hours and minutes logic. The 3th arm will be used with a solenoid, to play the westminster chime on a xylophone/glockenspiel. I bought a cheap xylophone via Ebay in Korea, and designed a new “half round” chassis, to put the metal “notes” on. but it will take some more weeks before I can start writing the software to control this clock. For some project(s) next year, I needed a much larger print-area ! While surfing for such a large printer, I noticed pricing for these devices starting at 4000 euro ! 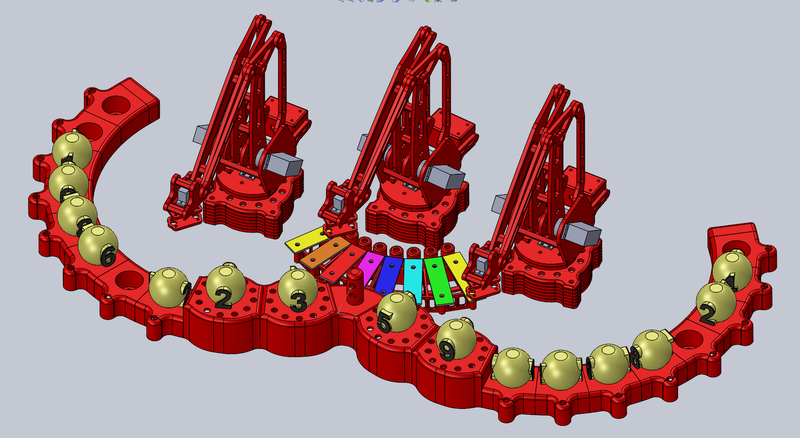 I started drawing in … Solidworks (what else ? lol) I’m sure I can build this “beast” for a few hundred euro. 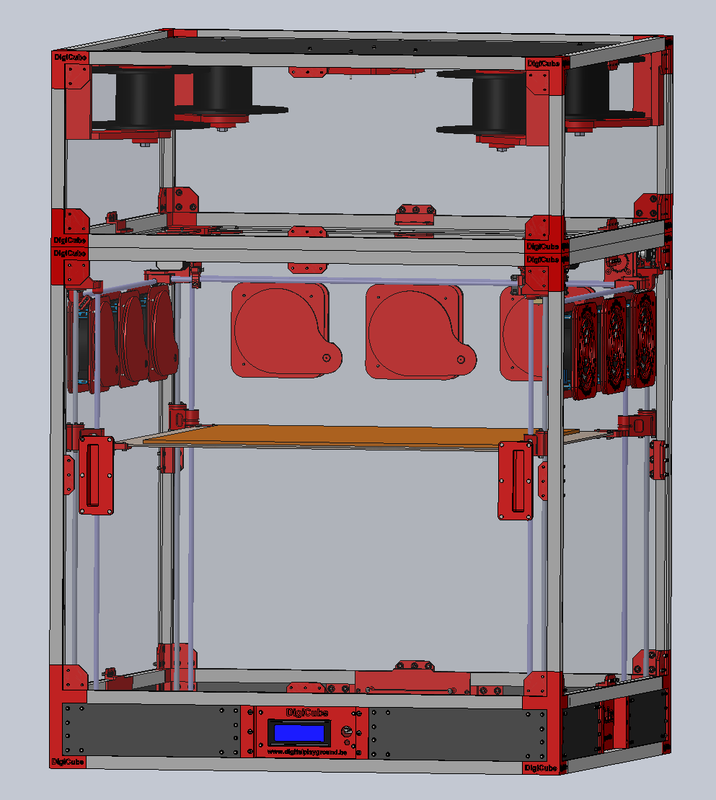 Build-area will be about 55 x 55 x 55 cm (a bit more actually), and the main printer dimensions will be 79,8 x 79,8 x 79,8 cm. For those of you who don’t know what EL tape is, it literally tape, that lights up, when you put electricity on it.